The Horse Capital of the World! Talon Winery is two minutes away. Come to Talon Winery and stroll through our lush vineyard and uniquely inviting tasting room and gift shop located in the original 18th century farmhouse. 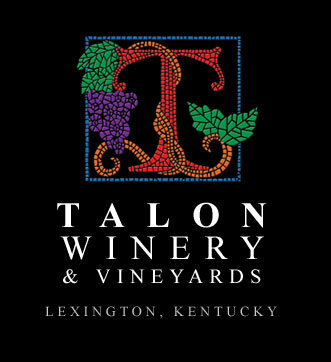 Talon's five-acre vineyard sits on 300 acres of rolling farmland with many ponds, red roofed barns, and pleasant breezes. Meet our winemaker and be a part of the winemaking process, from vine to bottle. Enjoy a group outing or a couple's escape. Entertain a small group in our private tasting room or create your own event at our open-air pavilion with fully equipped kitchen. Come relax and celebrate with Talon. Just minutes away, nestled in the scenic heart of the Bluegrass region near Lexington, Kentucky, is where you will find Jean Farris Winery. This small family owned vineyard and winery was conceived through the passion of Ben and Jeanie O'Daniel. Both from second-generation Kentucky wine families, the O'Daniel's purchased this property with the hope that this unique terroir would meet and exceed their standards. Ben and Jeanie’s fifteen years in the industry as winery consultants has enabled them to open their doors for the first time under their own label, Jean Farris, with the focus on creating fabulous wines by growing and selecting some of the most sought after grapes in Kentucky, affordably priced for the novice and connoisseur alike. Premium wine has always been the goal but Ben and Jeanie have never forgotten that wine is meant simply to be enjoyed. Ben and Jeanie believe wine is as much apart of the table as food. Therefore to enhance the wine-tasting experience, Jean Farris is pleased to announce the completion of the Bistro Tasting Salon at the winery. Jean Farris is creating fresh regional cuisine that focuses on the reactions between food and wine to create a properly balanced dish that complements the wine. It is all about the wine and food experience at Jean Farris Winery. Jean Farris Winery is located on one of Kentucky’s most traveled scenic byways surrounded by beautiful horse farms and vibrant scenery. Fewer than six miles from both exits 99 (Clay’s Ferry) and 104 (Lexington/Athens), Jean Farris on Old Richmond Road is easily accessible to those traveling along the I-75 corridor whether they live in Kentucky or are simply traveling through. Chrisman Mill Winery - Hear the laughter of children at play while their parents stroll down long rows of lush grapevines to select the perfect picnic spot. Walk the cobblestone trail to the winery, past the trickling waterfall and quaint wooden bench where hard-working hands have placed the results of that morning's work in the herb garden. Turn the handle of the winery's wide French doors, and step into rooms filled with the soft colors and old world feel of the Tuscan valley and smell the Chrisman Mill homemade wine breads. As you lift your first glass of master winemaker Chris Nelson's nationally acclaimed wines, take a moment to gaze out over the soft Kentucky countryside and rolling hills. There's so much to experience that you'll find yourself planning your next visit before this one's truly overinery and Vineyards at historic Fair View Farm is Lexington, Kentucky's winery. Stroll through our lush vineyard. Equus Run Vineyards - Nestled amidst picturesque stone fences and rolling fields of bluegrass, in the quaint town of Midway Kentucky is a surprising place to find a world-class winery. Isn’t it time you discovered the secret? For harvest, press and fermentation, we use traditional techniques. Our wines are kept in separate lots throughout fermentation with particular barrel and stainless regimes and we maintain control over every step in the process. Once in the barrels or stainless tanks, our winemaker frequently tests and waits for the perfect time to handcraft each wine. Equus Run Winemaker Cynthia Bohn continually focuses on layering the outstanding flavors to create wines with depth and complexity. For harvest, press and fermentation, we use traditional techniques. Our wines are kept in separate lots throughout fermentation with particular barrel and stainless regimes and we maintain control over every step in the process. Once in the barrels or stainless tanks, our winemaker frequently tests and waits for the perfect time to handcraft each wine. Equus Run Winemaker Cynthia Bohn continually focuses on layering the outstanding flavors to create wines with depth and complexity. The Valley View Ferry is operated jointly by the governments of Lexington-Fayette, Jessamine and Madison Counties. It shuttles vehicles and passengers across the Kentucky River, on SR #169, which is Tates Creek Road. The chief advantage of using the ferry boat is to substantially reduce commuting time beween these areas. It is also a novel side-trip or weekend excursion, enjoyed by all, especially young children. The Ferry, run by various operators over 210 years, was damaged by the weight of heavy snow in January, 1996. It was then put in dry dock for rehabilitation, which eventually led to the construction of a new boat, with only the old engine and paddlewheel remaining. The new boat, "The John Craig", which cost $40,000, was dedicated June 7,1996, on the Fayette-Jessamine Counties' side of the Kentucky River. In March of 1998, the ferry's guide wires and connecting towers were replaced, using a $200,000 Federal grant. Head Captain is Will Horn and the 2nd Captain is Eric Underhill. The Ferry is managed by the Valley View Ferry Authority, composed of citizens and government officials from the three counties served. The Valley View Ferry is just a few miles down the road from Ardinn Farm. This a fun trip! The Kentucky Horse Park is an equine themed park and competition facility dedicated to man's relationship with the horse. Set on more than 1,200 acres in the heart of Kentucky's famous Bluegrass region, the park is THE place to get close to horses! Home to approximately 50 different breeds, large and small, the park introduces you to the world of the horse. Experience the behind-the-scenes sights and sounds of a real working horse farm as you explore the grounds, and enjoy spectacular live presentations, horse shows and special events throughout the year. Spend the day exploring the Kentucky Bourbon Trail, connecting the nation's Bourbon distilleries, where you can see the art of Bourbon-making being practiced much as it was 200 years ago. Visit the producers of "America's ONLY Native Spirit" and experience for yourself the magic and science of the Master Distiller's craft - all within an easy day's drivethrough the rolling Kentucky hills. All distilleries are within a one hour drive from Ardinn Farm. We recommend Buffalo Trace! FOUR ROSES will be closed December 24, 25, 26, 31 and January 1, 2006. After January 1, tours are Monday through Saturday, 9:00am - 4:00pm (last tour begins at 3:00). HEAVEN HILL will be closed Christmas day, but open on Monday, December 26. As of that date, they will be open on Mondays and closed Sundays. Extended tour hours December 1, 2, 3, 9, 10, 15, 16 and 17 from 10:00am to 8:00pm. JIM BEAM will be open for tours on their regular schedule December 26 - 31. MAKERS MARK will be open regular tour hours, but closed on December 24, 25 and January 1. Candlelight tours available December 3 and 10 from 5:30 - 7:30. WILD TURKEY will be closed for tours December 26, but thereafter open for regular tour hours.